Biofuel Caffeinated Popcorn: Better Than A Cup Of Coffee? When normal popcorn just ain't doing it for you, then maybe it's time to switch to the Biofuel Caffeinated Popcorn. If you want a pick-me-up other than coffee, then here's some good news: each bag of this popcorn contains just as much caffeine as a single cup of joe. The best part is that it still tastes just like normal popcorn would: sweet and just the right bit of salty. Mmm-hmm. You might become so addicted to the Biofuel Popcorn that going back to the normal movie theater popcorn just isn't an option. Note, however, that it's best served to young adults aged 18 and above. If your kid isn't drinking coffee, you wouldn't want to sort of let him (unknowingly) get hooked on caffeine via the popcorn now, would you? Not only is a great pick-me-up during the day, but it tastes fantastic! The sweet and salty taste will impress any snack lover who will truly appreciate this of caffeine infused popcorn!Comes in a craving satisfying 5oz bag! Contains about as much caffeine as a strong cup of coffee. Recommended for active and/or healthy individuals over the age of 18. 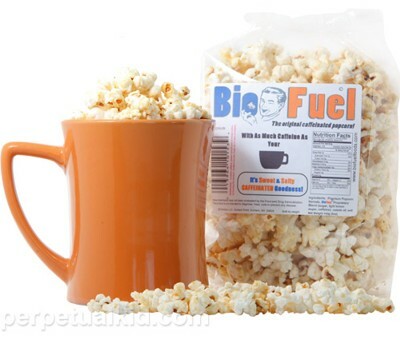 Each bag of Biofuel Caffeinated Popcorn costs $3.99 and is available from Perpetual Kid. Joe Bike Cash For Clunkers: Trade Your Old Car For 2-Wheeled Transportation!